I am so excited to be guest posting for Nikki today! My name is Elyse and I blog at Six Sisters’ Stuff. Nikki and I grew up in the same neighborhood and have been best friends since the 2nd grade! 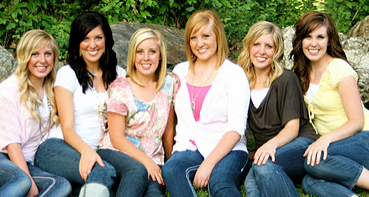 I have been blogging with my sisters since February 2011. We love to share easy family recipes, crafts and ideas! I love Girls Scout Cookies! When we were younger, our Mom would let each of us pick out a box of cookies. We would hide them under our beds and savor them as long as we could! I was known to be the sneaky one in the family, and I would sneak into my sisters’ rooms and find their hidden stashes of Girl Scout Cookies. I always knew the sisters who ordered Thin Mints would never notice me taking one because they came with more cookies than the other flavors. :) Now I will never have to steal cookies again! In a large mixing bowl, beat butter until light and fluffy. Add powdered sugar and mix until combined. Mix in vanilla, salt and cocoa. Add flour and mix until combined, but slightly crumbly. Chill dough in the refrigerator for 20 minutes. Remove dough from the fridge and knead a few times on a lightly floured surface to warm up. Preheat oven to 350 degrees. On a lightly floured surface, roll out dough to 1/8″ in thickness. Use a 1-1/2″ cookie cutter to cut circles of dough (or whatever shape or size you prefer). Place cut circles on a baking sheet lined with parchment paper. Bake cookies for 9-10 minutes, or until edges are set. Let cookies cool completely. After cookies are cool, place chocolate chips in a microwave-safe bowl. Microwave in 30-second increments until melted. Stir in peppermint extract until smooth. Place cookies in the chocolate one at a time, using a fork to flip and lift cookie out of the chocolate. Transfer the chocolate covered cookie to a baking sheet lined with wax or parchment paper. Repeat with remaining cookies. Let chocolate harden before serving. You can place cookies in the refrigerator to set the chocolate faster. Looking for more minty desserts? I am SO sorry to hear about what happened t your thumb!!! That sounds aweful! What a good reminder to myself, though, of how careful I need to be! Take care of yourself and enjoy that good cookin' of from your momma! These cookies look fabulous. 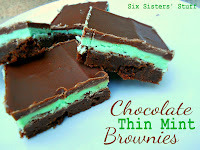 I love thin mints so much, and I'm sure this recipe would be even better since they are homemade. Six Sister's Stuff is always tasty!! Wow! I am sorry to hear about your thumb. I hope that it heals quickly but you are so lucky to have good friends and a wonderful mother! Take care and enjoy the love of those around you! OUCH! ooo that gave me the chills just thinking about part of a thumb being stitched back! Hope it heals soon! Ps. Love these cookies. Thin Mints are my favorite! I love thin mints, and have always wanted to try making my own. 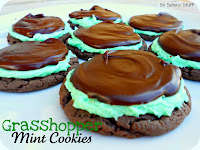 These look perfect - I bet they are even better than the Girl Scouts! Hope your finger heals quickly Nikki! Making my own thin mints are on my list of things I want to try to make myself. I can't wait to try this recipe! Ouch! I hope you heal quickly. Enjoy some time off! You families must be so happy to have such good cooks and bakers! Everything always looks too good! 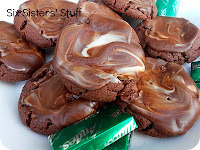 I love Thin Mints and it's nice to see a from-scratch recipe that's as easy as this one! And Nikki, I am so sorry to hear about your thumb! I did the same thing to mine 5 years ago...and have not touched my mandolin since! I hope you heal up soon and take care. Hand cuts are the WORST....so painful and they take forever to heal with the washing, drying, etc that our hands go thru. HUGS! I am SO sorry about your thumb Nikki! I hope it heals super quick! I am in the process of making these now. I found that the dough is super crumbly, dry even after chilling it in the fridge. I had to add some water to the dough to be able to roll it out and have it actually stick together. Did anyone else have this trouble when making the dough?? Also, the cookie part is not very sweet. I hope the chocolate coating will offset this.